Our Mormugao cruise port guide gives you information about the docking location, cruise dock, transportation options and much more! 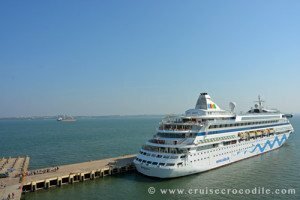 Welcome to the Cruise Port Guide Goa – India. The cruise port of Goa lies in Mormugao. This small town lies in the state of Goa which is India’s smallest state. It is a famous destination best known for its beaches, Portuguese history and hippies! Goa has a great climate, beautiful hills and a strong history which makes it completely different from the rest of India. In 1510 Alfonso Albuquerque’s fleet arrived on the shores of Goa. He identified Goa as the perfect base for the expansion of his maritime empire. In the next 150 years Portugal would blossom, build an empire, claim the power and spread christianity. The Portuguese build over 300 churches which still stand today. These buildings stand witness to the 451 years that the Portugese would have control on this part of India. This is the cruise dock in Marmagao in Goa. This pictures was taken from the cruise ship looking out over the dock. The white busses in front are the shore excursion busses. Behind the red roofed building is where you will find the local taxis and rickshaws. Once you pass the port gates, find yourself a white taxi and negotiate a price. Your ship will have to dock at the Marmagao Port. There is no terminal building and hardly any port facilities there. From the port it is possible to take public transportation although we do not advise you to do so because it will not get you to any of the tourist sights and it might not be meeting your comfort level. Find the local bus stop on the square in front of the port exit. Pay the driver 3 Indian Rupee for a ticket. This is the nearest local town to the cruise dock. Find it just over the hill. Because it is hot and quite a walking distance we don’t recommend to walk it, rather take a tuk tuk. There are absolutely no tourist site in this town, just local life. This is the closest beach to the cruise terminal and it is nice! There is fancy hotel and some local shops that provide you with anything you need. Seating facilities however are limited, so make sure to bring a towel! The snorkelling here is great, although you will need to bring your own snorkel. The beach is about 15 km from port. Pay no more than 20 us dollars one way by taxi. 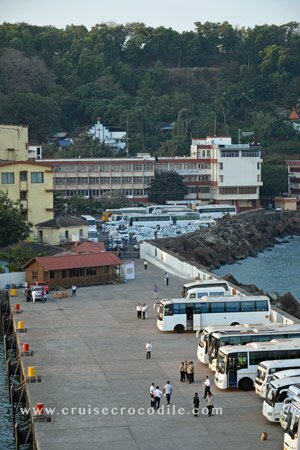 Cruise ships dock at the port of Marmagoa in Goa. 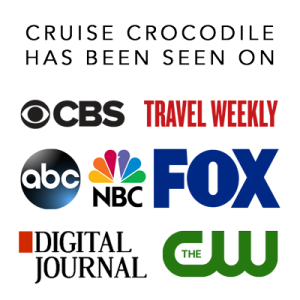 The cruise dock has limited facilities available and you will need transportation to visit any attractions in the area. 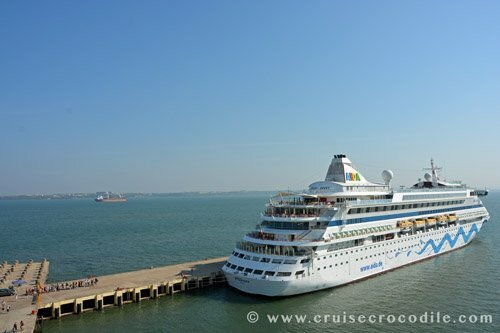 Read the full Goa cruise port guide for all the information. On the island of Chorao you will find the bird-watchers paradise Dr Salim Ali Bird Sanctuary. It is about 1,8 sq km. It is not just local and migrating bird that you will find here. You can also spot flying foxes and crocodiles. 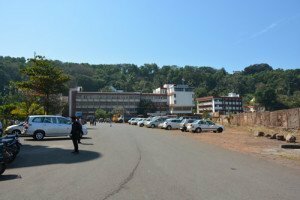 To get there take a taxi from the dock to the Ribandar ferry wharf and take the ferry across the Mandovi river to the island of Chorao. The bird sanctuary is within walkin distance from the ferry wharf. Find this bird sanctuary about 32 km north of the port. Looking for a beach day with the best facilities? Than consider to visit the Taj Exotica at Benaujim beach. The resort is open to the public. You pay a small fee for a day pass. Make a deal with a taxi driver for a round trip fare. Find Benaulim beach about 37 km south of the port. Close to Panji you will find one of the many fortifications dominating the Goan coastline. Fort Aguda was build in the early 1600’s to protect the entry of the rivier that would lead to Old Goa. Portuguese ships would make the long journey over from Lisbon to Goa and this would be the first place where they would receive their fresh water and welcome. Find Fort Aguda 45 km north for the port. Although the area of Goa might be all about the Portuguese history, let’s not forget that the mayor religion of the area today is Hindu. About 65% of the population is Hindu. Visit the Sri Mangueshi temple which is one of the largest and most popular hindu temples in the area. The temple is 400 years old and devoted to the reincarnated version of Shiva: Manguesh. Remember: When visiting the temple shoulder and midriffs must be covered and shoes must be removed. Find this temple 36 km east of the port. After Old Goa was the capital Panaji would take over this title. 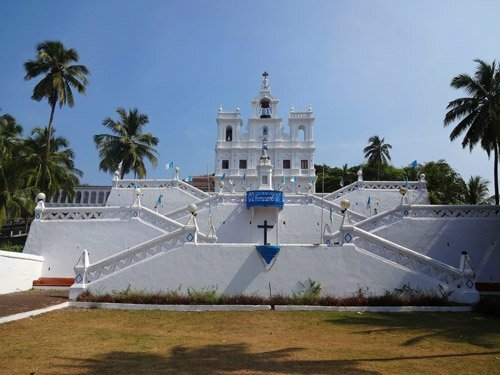 This lovely town is known for it’s whitewashed catholic churches, palm lined plaza’s and Portuguese architecture all displaying the wealth of the Goan Merchants. Find Panaji 34 km to the north of the port. If you want to get into local life visit the local village of Margao. It is Goa’s second largest city. Visit its market to get a sense of what the local cuisine and local products are all about. Find Margao about 28 km south of the port. Old Goa used to be the capital of the Portuguese colony. Over time the Portuguese build the largest Christian churches in South Asia here in Goa. Eventually due to mayor outbreaks of cholera the capital was moved in 1843. The churches are nowadays in bad shape but they still reveal the former glory of the Portuguese empire. That makes this town a must see for anyone that has an interest for religious architecture and Catholic history. Find Old Goa about 30 km north east of the port.